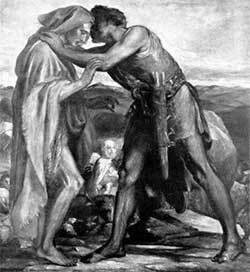 Jacob returns to Canaan, and is welcomed by Esau. ACOB REMAINED TWENTY years with Laban, whose daughter Rachel he had married. In those days men's chief riches consisted in flocks and herds; and Jacob had the care of those belonging to Laban. His uncle tried to deprive him of the wages which he had promised to give him; but, notwithstanding this, Jacob himself grew rich in cattle, and beasts of burden, and numerous servants. At the end of the twenty years that Jacob had been with Laban, God bade him return to his own land; so he gathered together all his possessions, and set out on his way thither. As Jacob still feared the anger of his brother Esau, whom he had cruelly treated, he sent messengers before him into Edom, where Esau lived, to say that he, and all his family with him, were coming, and that he hoped his brother would be friendly with him. But when his messengers returned, bringing word that Esau, with four hundred men, was advancing to meet him, he was much afraid, thinking now his brother was going to kill him. So he divided his people and his flocks into two companies, that if the one were attacked, the other might escape away; and when he had done all that he could for self-defense, he prayed to God that Esau might not kill him, with his children and servants. Then he took a great number of his cattle, his sheep and camels, and sent them on before him in separate droves, bidding the men who were with them tell Esau, when they met him, that they were a present from his servant Jacob. It was not long before Esau and his four hundred men came in sight; and then Jacob, putting his children in a place of safety, went forward to meet him, bowing himself down to the ground to do honor to his brother. But Esau, who had forgiven his brother's ill deeds, ran to him in the most loving manner, kissing him, and weeping for joy that they had at last met. And he asked him kindly about all the people with him and what was the meaning of the droves of cattle he had seen on the road. Jacob told him that the people were his family, and that the cattle were for a present to himself. And when Esau refused to take it, he urged him, that he might be sure his brother had forgiven him. Then Esau returned to his own country, and Jacob, in time, came back to the land of Canaan, as God had promised that he should do.